The latest Windows release will be available to everyone after a surge in demand crashed the Microsoft website on 9 January, the original release date. 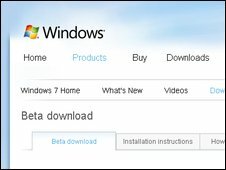 In response, the company has lifted a planned limit on the number of copies of the Windows 7 Beta available for download. Microsoft delayed the launch by one day to add "more infrastructure and servers" to cope with demand. The unlimited download will last for two weeks, according to Microsoft. Microsoft had initially planned to restrict downloads of the software to 2.5m copies, but now says that unlimited copies will be available until 24 January. After that, the limit will be reinstated, though it looks likely to be surpassed by then. Laurence Painell, product manager at Microsoft, said that it had removed the download limit so that Windows 7 would be available to "a much wider audience". "We would expect a beta to only be of interest to tech-enthused and those that have a vested business interest, to look at an operating system for testing purposes," Mr Painell explained. "We didn't quite anticipate the demand that we saw." Windows devotees flooded the Windows 7 blog with comments while waiting with bated breath for the delayed download. A commenter on the blog called Adinelus posted from Romania on 9 January: "Thank God it's Saturday tomorrow, otherwise I would have missed this. "Hope you guys have some spare servers…because millions wait for you!" Mr Painell stressed that consumers should be aware that they are getting a preliminary version of Windows 7 which is meant for testing. As a result, the software is likely to have problems that haven't been ironed out, and Microsoft does not provide technical support for it. "It's not ideal for every consumer to install and use it on a daily basis," he explained. Microsoft encouraged people with MSDN (Microsoft Developer Network) or TechNet accounts to download the software through their subscriptions, to avoid the congestion on its public sites.